Jurassic World was built over the remains of Jurassic Park, and a jaded public’s appetite for bigger and more dangerous creatures has led a team of entrepreneurial scientists to not just replicate species from DNA but to create dinosaur hybrids. Bigger and more dangerous ones. A lot of people have called Jurassic World the best thrill ride in the series, but I still think it takes a backseat to the 1993 film that started it all, which had more memorable characters, moral debates, and moments of sheer terror. There aren’t nearly as many iconic scenes in this third sequel to match the outhouse segment or the raptors in the kitchen. But there IS nonstop action and some pretty big and dramatic special effects. Jurassic World features the best-looking CGI dinosaurs I’ve seen—and that incudes a gigantic fish-like mosasaur that’s even more impressive than the featured terrorizer: a hybrid killing machine named Indominus rex, created with the combined genetic makeup of a T-rex and velociraptors. But in Jurassic World it’s not just a small group of visitors at an empty park that dinosaurs terrorize. The park is open and chock full of visitors, and at one point everyone is attacked by flocks of prehistoric flying reptiles in a scene that will have movie fans thinking back to Hitchcock’s The Birds. 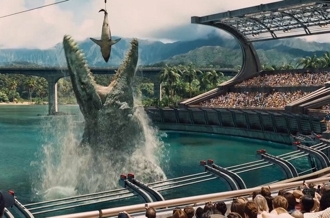 From that point, Jurassic World has the feel of a disaster movie. Chris Pratt makes for a hunky Indiana Jones-style hero who’s a little scruffy and rides a motorcycle—just enough to qualify as a “bad boy” for female audience members. He’s more animal trainer than scientist in this fourth installment, which features some pretty cool scenes of him putting a pack of Velociraptors through their paces. In a nod to the original film, B.D. Wong turns up again as the chief geneticist, and a couple of Jimmies appear in brief cameos: Fallon and Buffett. But perhaps the biggest surprise of the movie is director Colin Tervorrow, whose previous credits only included an Australian romantic comedy, a reality show documentary, and a TV movie. His vision clearly matched what Universal had in mind. 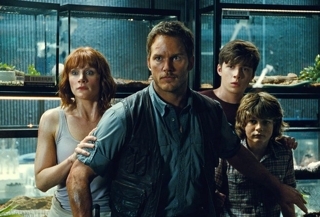 If Jurassic Park merits an A, then Jurassic World gets an A-. If you’d give the first film an A-, then this one is a B+. 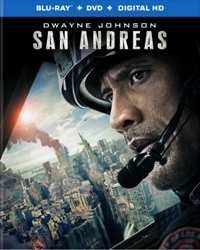 It’s not off by much and it certainly beats The Lost World: Jurassic Park 2 and Jurassic Park 3 by a long shot. It’s no surprise that Pratt, who’s already in pre-production with a Guardians of the Galaxy sequel, is signed on to appear in another Jurassic World film that’s slated for 2018 release. 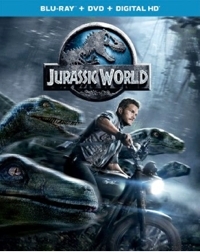 They’re calling it a sequel to Jurassic World, which means they’re thinking of this movie as a reboot. And as such, it’s pretty darned successful. Stand-up comedian Don Rickles made a career out of insult humor and politically incorrect jokes aimed at all races. So what better sitcom for him to star in than one that has him playing a Chief Petty Officer at a U.S. Naval training facility in San Diego, where he gets to go off on recruits—especially when those recruits include a Polish American, a Jewish American, an Italian American, and a Puerto Rican? Call it Sgt. Bilko revisited, because Rickles is surprisingly good at playing a tough, acerbic CPO with a warm heart. The show lasted only two seasons, but it’s not because the sitcom isn’t funny or because the cast isn’t likeable. My guess is that it was another case of bad timing. The public already had one sitcom with politically incorrect humor, and did America really want or need another Archie Bunker? That’s not fair, though, because Bunker was racist without knowing or admitting it. He tolerated black neighbors but wasn’t really friends with them. Sharkey is best buddies with fellow CPO Dave Robinson (Harrison Page), an African American with whom he feels comfortable enough to make racial jokes. Notice I said “racial,” not “racist.” There’s a difference, and in today’s hyper-politically correct world that difference isn’t acknowledged—hence the warning on the back of this DVD: “Some of the jokes and ethnic references heard in these episodes would most likely not be allowed on network TV today and reflect the tenor of the times.” Because of that racial humor, CPO Sharkey: Season 2 will only be for families with children old enough to realize that such jokes can’t be made today, no matter how fond you are of a person. 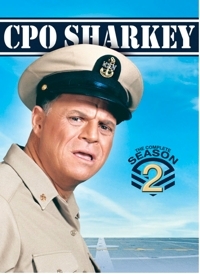 Still, CPO Sharkey is a refreshing change from the steady diet of family sitcoms that TV serves up. This second season begins as the first did, with a new commander taking over and rubbing Sharkey the wrong way. As with the first season, some of the humor is topical and has lost its comic edge, but the bulk of the jokes are of the insult variety—what Rickles was known for—and that never goes out of style. Just ask your junior high or high school family members. This season is a little more uneven than the first. 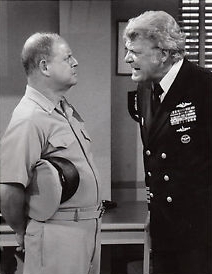 In some of the best episodes, Sharkey butts heads with “The New Captain” and can’t have fun on leave in San Francisco because he’s crammed into tight submarine quarters with Captain Buckner (Richard X. Slattery) in “Operation Frisco.” Sharkey’s barrack is selected for a coed pilot program in “Don’t Make Waves,” Sharkey’s girlfriend tells him he’s insensitive in “Close Encounters of the Worst Kind,” Sharkey breaks up a fight in a punk-rock nightclub (“Punk Rock Sharkey”) and has to deal with a runaway teen, Sharkey is afraid of flying and has to face the aerial music in “Fear of Flying,” and when Sharkey moves into an off-base apartment his life turns quickly off-base. Of the 22 episodes, nine are B or better, and the rest are C or C+ quality. Takeaways: It’s hard to believe what TV got away with in the ‘70s, but while C.P.O. Sharkey is entertaining you have to be okay with insult humor to really like the show. Aladdin was the first animated movie to gross more than $2 million, and it’s always been one of our family’s favorites. What’s not to like? It’s a rags-to-riches story about a petty thief who becomes a prince. It’s a love story about a feisty princess who refuses to marry unless she has feelings for him. It’s one of the intricately and energetically animated films with music that was produced during Disney’s so-called second Golden Age, which began with The Little Mermaid and ended with Tarzan. And it’s a story about wishes coming true, which is pretty much the Disney brand in a nutshell, isn’t it? Ron Clements and John Musker co-wrote the screenplay and co-directed this adaptation of “Aladdin’s lamp” (One Thousand and One Nights). 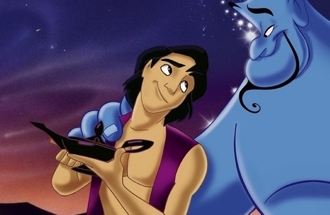 But for all the hype over Disney princesses, Aladdin has always been and will always be Robin Williams’ film. The late comedian was so perfect as the voice of the big blue Genie that Disney gave Williams top billing—the first major animated film to be promoted on the strength of a major star as one of its voice talents. Williams improvised roughly 16 hours of material for animators to draw upon and changed so many lines on the fly that the script was denied an Academy Award nomination for Best Adapted Screenplay. It remains the funniest animated Disney movie ever, and it’s mostly because of Williams. You’ll recognize Scott Weinger’s and Linda Larkin’s voices as Aladdin and Princess Jasmine, but Williams makes this world go ‘round. There’s more, of course, including terrific animation and memorable songs by Alan Menken and Howard Ashman. “A Whole New World” is the gem in the film’s musical crown, and anyone who’s been to a Disney theme park and seen that now-iconic clip in 3D will remember how romantic the scene is as Aladdin and Jasmine fly over the world on their magic carpet. But atmospheric and energetic numbers like “Arabian Nights,” “One Jump Ahead,” “Friend Like Me,” and “Prince Ali” are also sparkling. Aladdin isn’t as frightening as some animated Disney films, even though there are moments of peril as, for example, when the characters enter the Cave of Wonders to retrieve the lamp. Legend has it that only a “diamond in the rough” can accomplish the task, and that, as it turns out, is Aladdin. So there’s adventure, but the stage was set for a love story from the first scene when Jasmine, feeling a prisoner in her own palace, first met Aladdin in the marketplace after sneaking out to experience village life. Both hero and heroine are extremely likable, and the villain, while not one of Disney’s best, is a solid second-tier bad guy. The sultan’s advisor, Jafar (Jonathan Freeman), is a Rasputin-like wizard who’s played with Maleficent-like relish and whose companion is a wisecracking parrot named Iago (think Othello). 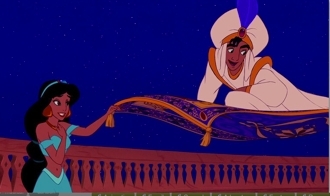 Jafar wants the lamp in order to become sultan, and of course he’ll do anything and hypnotize anybody to get it. There are thrills and moments of peril that balance the humor and romance, but the closest thing to a PG rating comes when one character is lost in the mouth of the cave, another is threatened with the loss of a hand, and still another transforms into a rather scary reptile. But what’s striking about Aladdin all these years later is how contemporary it still feels, how edgy, and how jam-packed full of energy it is. And I really can’t emphasize enough how much better the film looks and sounds on Blu-ray. 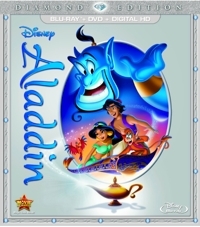 Aladdin on Blu-ray is a must-add to your family video libraries. 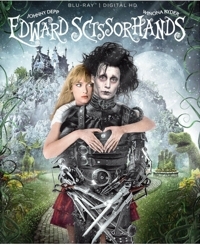 As the original TV series 21 Jump Street was winding down, Johnny Depp made the leap to a starring role on the big screen in Tim Burton’s fantasy-fable Edward Scissorhands (1990). 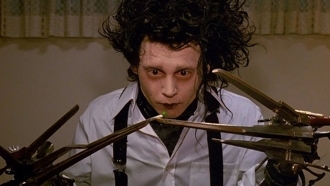 Edward wasn’t the first Goth, but he’s certainly the most memorable. Before his “makeover” he’s dressed entirely in black leather with studs and rings all over. With his hair spiked and face looking pale as death, he could easily have passed for one of those post-punkers that sprung up as a counterculture movement in the early 1980’s in London and Dublin—except that his hands were literally clumps of scissors. We learn in flashback that he lived in this Gothic castle with his creator (Vincent Price), an inventor who died before he could fit his beloved creature with a pair of hands. 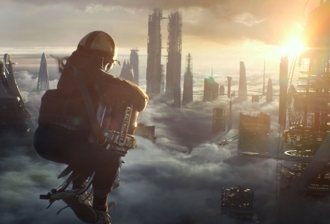 I’m just going to blurt it out: Tomorrowland is entertaining, but underwhelming—at least in the beginning. Even under the capable direction of Brad Bird (Ratatouille, Mission Impossible: Ghost Protocol) Disney’s latest onscreen theme-park ride feels uneven and unnecessarily complicated, especially in the early going. It takes 22 minutes before the film seems to find its footing. Until then, you’ll have family members asking what’s going on and whether the action is taking place in the past, present, future, or distant future. Later, it can be emotionally confusing, as persons we thought were human are struck by a car or beheaded in an explosion (Uh, Disney? )—after which we learn that they’re really highly refined futuristic robots. Until the plot kicks in, at least the art direction and set decoration and CGI world that the filmmakers create are all bright and shiny and impeccably rendered. Along with the action, it’s enough to hold your attention until everything starts to make more sense. Tomorrowland clocks in at 130 minutes, and if Bird had compressed and simplified that beginning it would have been a B+ film. Then again, that opening was obviously intended as a theme park tie-in. Instead of Disney World it’s the New York World’s Fair in 1964 that we enter, with a voiceover singing the theme song from the Carousel of Progress and one of the main characters urged to hop aboard a ride that just happens to be a modified version of It’s a Small World. 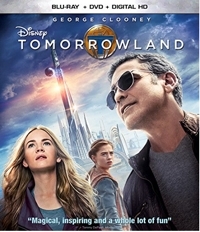 Two very different characters are targeted to receive a “T” button under mysterious circumstances: a boy genius who brings his Electrolux-converted jet pack to a World’s Fair Tomorrowland attraction, and a rebellious teen girl who sneaks onto a decommissioned NASA launch pad and is arrested for her trouble. But it’s only when that teen girl meets the grown-up boy genius that things really start to roll in this fantasy-adventure. I don’t know about hidden Mickeys, but you can spot Space Mountain in the midst of the futuristic world in Tomorrowland, and the special and visual effects are the film’s chief strength. Not far behind, though, are performances by Thomas Robinson as young Frank, George Clooney as old Frank, and Britt Robertson as Casey Newton. Even Raffey Cassidy as the mysterious Athena, a young girl who spans generations, adds to the mix so that collectively they make us care about the action, however confused it may be at times. Disney is known for its strong villains, but surprisingly Hugh Laurie as David Nix, the leader of Tomorrowland, isn’t played over-the-top. He’s more of a misguided misanthrope who could be anyone’s dad fed up with society and resigned to its doom. But the stakes are predictably high: the world will end in the near future unless Casey and Frank can do their thing, despite Nix’s attempts to, uh, nix that. It’s really pretty amazing what can be done with CGI these days, and Disney spared no expense. The film cost anywhere from $190 million to $330 million to produce and market, depending upon whose figures you buy. Meanwhile, the worldwide gross was $208 million, so financially it’s another big-budget Disney disappointment. But both of my teens said they’d definitely watch Tomorrowland again, and that says a lot. 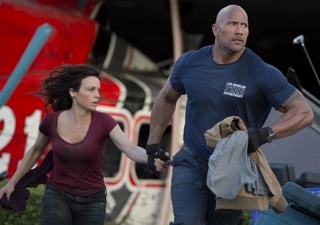 Once you get past a muddled beginning the action and story and characters make for an entertaining family movie night. Takeaway: Effects are great, but story still matters. And once this story kicks in, Tomorrowland is worth the visit. Golden Shoes is a Dove-approved film in the “family” category, and you know what that means: go for the heart, or head for the pulpit. Films in this genre are usually heavy handed and don’t trust the audience to get the message, so subtlety isn’t a hallmark. Plotting is usually as the crow flies, as direct (and often contrived) as can be. Characters are either good or bad, because the modern-day family movie is an update of the old medieval morality plays. And since the object of a feel-good movie is to make you feel good, there’s more than a little melodrama and emotion for emotion’s sake. Contrivance? No matter, as long as it offers a plotting shortcut or makes you feel something. Golden Shoes has all of the shortcomings of the genre. It also, surprisingly, has a few recognizable name actors to help shoulder the burden. John Rhys-Davies—who narrates Once Upon a Time and appeared in dozens of big films, including The Lord of the Rings: The Fellowship of the Ring, Bond film The Living Daylights, and Raiders of the Lost Ark—turns up as a mentor-of-sorts to young Christian (Christian Koza), who dreams of becoming a soccer star but only sits on the bench of his youth-league team. Dom DeLuise’s son, David, is a coach that seems too nice, even for a youth league. Montel Williams has a bit part, as does Vivica A. Fox, and Eric Roberts (The Dark Knight) gets the most air time as the boy’s next-door neighbor, who is by turns lecherous, helpful, crusty, self-absorbed, and just plain contemptuous. Like many family films, this one is a low-budget indie. But I have no quarrel with the production values. Many a decent indie film has limped along with low-budget audio and video and still finished strong. The biggest problem viewers will have with Golden Shoes is the plausibility, especially if they’re into youth soccer. First of all, it’s not likely at all for a single player to sit on the bench game after game. More than one? Sure. But any coach worth his whistle would have found a way to rotate in that last player without inflicting too much damage on the final score . . . or the kid’s psyche. And if you knew this kid’s dad was serving in Afghanistan and MIA, wouldn’t you try extra hard to give him some playing time? And no matter how rotten a neighbor you were, wouldn’t you take the kid in your custody to see his mom in the hospital more than once? Even more far-fetched is that these games, which appear to be played, like so many across America, on a small field with just a few parents watching, suddenly start to snowball to where, after Christian is inserted and becomes a star, they’re competing in a play-off game in a big stadium and the President of the United States is learning about this kid and orchestrating a rescue mission to bring his father home in time to see him play his big game. I’ve coached youth soccer and I’ve seen a lot of terrific players, but I’ve never seen a youth soccer player make newspaper headlines and TV newscasts, as happens here. And the whole idea of a big-venue game, ala Hoosiers, is just absurd. It’s fair to say that writer-director Lance Kawas got a little carried away. I would have been happier had he stayed with a smaller story, because while the acting isn’t going to win any awards, 12-year-old Koza is likable enough as Christian, and despite the fact that Roberts is all over the map as Frank, he’s still as mesmerizing as a train wreck in slow motion. This movie isn’t perfect, but I remember it weeks after seeing it, which isn’t always the case. I had the chance to do a phone interveiw with Christian Koza, who got into the business after three months of lessons, and he said that he has played soccer since he was three years old, and that he was as much of a goal-scorer as his character. “Some of it I could curve the balls. Maybe half, but some of it was CGI,” he said, adding that most of the kids who played soccer on camera were extras in a real league. Koza said it was fascinating watching Eric Roberts get into character, adding that the only time he actually saw him in a good mood (i.e., not in character) was with his dad on set. What drew Christian to the story was the fact that his character was bullied, and when I asked him whether he’d want a girlfriend in the sequel that’s in pre-production he said, simply, “No.” As in real life, he said he’d rather just concentrate on school and soccer. On the set, he said that he bonded with the young actor who played the goalie and that the two of them would always talk and eat and play X-Box. His favorite X-Box games? “All the sports games . . . . I don’t like the violent games,” he said. Now that’s the kind of honesty I’d prefer in the sequel, rather than a trumped-up world-stage scenario. Keep it simple. Focus on the kids and kid problems. It is, after all, a family movie.